The best chance to get Dragonslayer! Angel's Carnival is a traditional holiday in the Grace Continent. In this day, Angels wear special costume and celebrate for love and peace. Midnight's over, Carnival begins！ Collect Maracas from Elite Dungeon and exchange them for rich rewards! Come to join us with your friends, Carnival Party will start form 29th March to 2nd April. 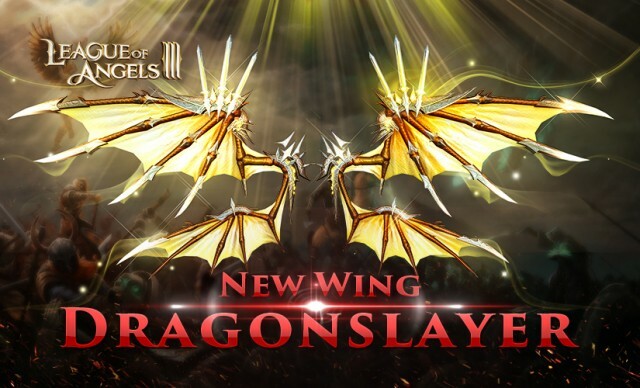 Dragonslayer, a brand new pair of wings is coming at Angels Carnival! Midnight’s over, Carnival begins! You could have the best chance to get Dragonslayer and collect Maracas from Elite Dungeon and exchange Maracas for rich rewards! Made by Dragon’s bone, Dragonslayer is the symbol of victory and honor of warriors, surrounded by sharp daggers, Dragonslayer could thrust into enemy’s heart easily. Dragonslayer, it represents power and fear. Once you unlock Dragonslayer, you could gain over 120K BR and a perfect new look of Hero feature! Let’s party rock! Don’t miss the chance to unlock the party exclusive items before the event ends! During the event, players can exchange for the latest wings by meeting the certain requirements! 2. When you meet the recharge requirements, you could purchase Dragonslayer Sigil (3 days) with great discounts! >> More important, login for 5 days, you could get Djembea, Dragonslayer Sigil (3 days) and other rewards for totally FREE! >>You could increase your BR over 120k by unlock Dragonslayer and grant massive bonus HP (+54K), ATK (+16K), DEF (+10K). >>During the party time, you could use Brilliant Feather or Topaz to spin the machine and win the extra Diamonds and Djembe. >>Moreover, using Prize x5 will automatically multiple all prizes by x5 (you can earn x25 prizes if you also get x5 in the last column)! Tips: You could get an amount of Maracas in Elite Dungeon to exchange rich rewards! Please note that the above content might be adjusted due to changes in the development plan. Final updates will be determined in-game.